Whether you're looking for ideas on raising children, homeschooling, domestic solutions, thoughts about being a wife or mother...this blog offers ideas for intentional living in your home. This place creates energizing images of what can materialize in your home. Dreams emerge into reality. May this place encourage you to create a safe haven, an open door and everyday joy in your own home. Through this new guide, Nurturing My Nest, and her blog she answers these questions and more. She stresses the importance of promoting high standards of academic excellence coupled with a personal relationship with God. By combining the academic and the spiritual, she advocates the development of a new generation of Godly young men and women. Accessing online resources for homeschooling. With her tips about time management and planning, you can give your children a unique educational experience. In Nurturing My Nest, Leah Simpson shares from her wealth of experience and expertise in all areas of the home. I have known Leah for many years and have admired how intentional and engaged she is with her family. She and Tim and their five children have created a warm and hospitable home where guests feel welcome and look forward to being invited back. I am drawn to her gracious spirit and genuine walk with Christ. I recommend her book to all young mothers who long to “train up their children in the way they should go” (Ps. 22:6). Nurturing My Nest will give you great ideas and suggestions for education, home organization, meal planning and so much more! 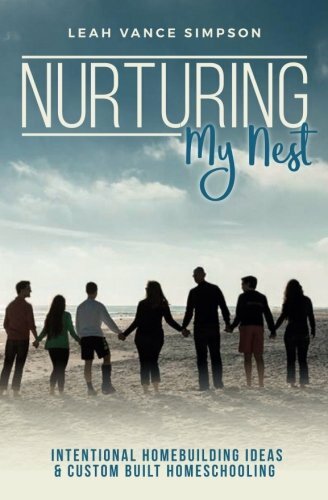 — Donna Gaines - Wife of Pastor Steve Gaines, Author of "Leaving Ordinary: Encountering God Through Extraordinary Prayer"
Nurturing My Nest is a refreshing look at the ins and outs of homeschooling from a mother who is a master at designing a curriculum to fit the unique giftedness of the whole child. The product of a homeschool education herself, Leah has not only created individual programs for each of her five children, but she has also taught countless others to do so as well. In this comprehensive handbook, you will find helpful insights, practical ideas, and spiritual encouragement to support you in your homeschool journey. Maximize your productivity each day with this simplified TO DO List. Identify what is important to you so you can accomplish the things that make your day most productive. Welcome To Nurturing My Nest!